Will meeting between Mike Pompeo and Kim Yong Chol take place in November? High-level talks between the United States and North Korea have been postponed, the State Department announced Wednesday without giving a specific reason for the decision. 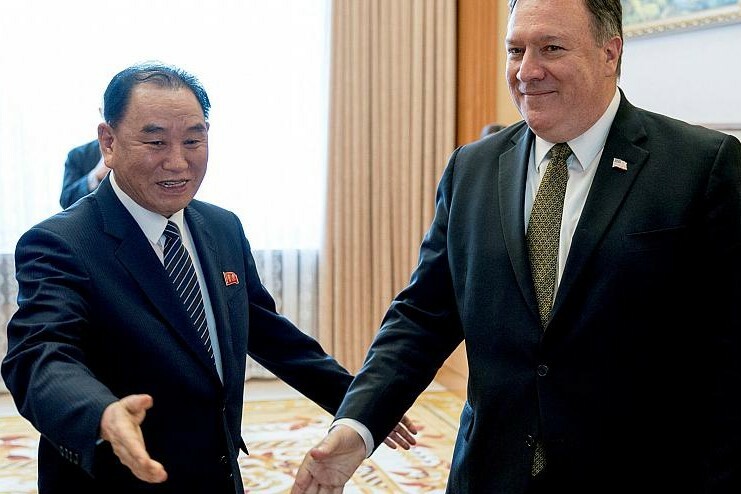 Secretary of State Mike Pompeo had been scheduled to meet with senior North Korean official Kim Yong Chol in New York on Thursday. The meeting was billed as preparation for a planned second summit between President Donald Trump and North Korean dictator Kim Jong Un. The State Department said that Pompeo's meeting "will now take place at a later date" and the two sides would "reconvene when our respective schedules permit." Trump and Kim met in Singapore in June, signing an agreement that pledged to work toward to denuclearization of the Korean Peninsula. Experts criticized it for being vague on detail. Since then, little headway has been made and both sides appear to be hardening their negotiating positions. Last week, North Korea warned it could resume its state policy of strengthening its nuclear arsenal unless the U.S. lifted sanctions. In August, Trump abruptly canceled another visit by Pompeo to North Korea, citing a lack of progress in the talks. Reacting to Wednesday's postponed meeting, South Korea's Foreign Ministry said the decision was disappointing. "We have hoped for real progress toward denuclearization and establishing permanent peace on the Korean Peninsula through the U.S.-North Korea high-level talks," a Foreign Ministry official said. "So it is a shame that the meeting is not happening." The official spoke anonymously in a background briefing to reporters. South Korea hopes the meeting will be rescheduled as soon as possible, the official said, but added that "we should not read too much into the ups and downs in the process."